Zero to One Million is my effort to share my message of entrepreneurial possibility and social change, help anyone (who believes they truly can be) become a multimillionaire entrepreneur, and make what I’ve learned the hard way about entrepreneurship, raising investment, venture capital, opportunity evaluation, product development, business planning, building a sales team, management, hiring and retaining superstars, organizational behavior, web 2.0, marketing, and scaling a business accessible to anyone. 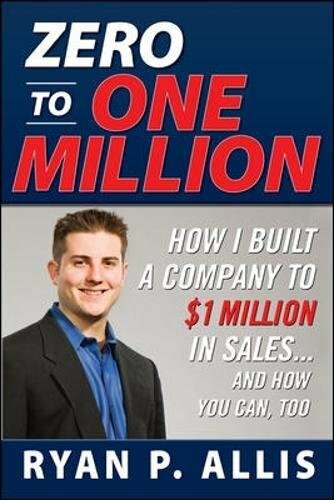 Zero to One Million provides a ten step process for building a company from idea stage to over $1 million in annual sales based on my experience building iContact over the past five years to over $10 million in annual sales and 80 employees. Do You Want to Become a Multi-Millionaire Entrepreneur? Here’s How. By the time Ryan Allis had reached the age of twenty-one, he had achieved the financial goal most people just dream about: He made built his company to one million in sales. Allis has since grown his company iContact Corp., a provider of Web-based email marketing and online communication softwares, to $10 million per year in sales, and has helped numerous clients increase their sales dramatically. Now Allis shares the secrets of his lightning-fast success with you. In Zero to One Million, he details his simple yet innovative evaluation system of “Market-Advantages-Return” to help you determine if your business idea is viable. Once you have a solid foundation, you can apply his advice for successfully running your business-from initial planning to managing high-speed growth. Did you know that eighty-one percent of millionaires are entrepreneurs? Join the pantheon of successful businessmen and women with Zero to One Million.